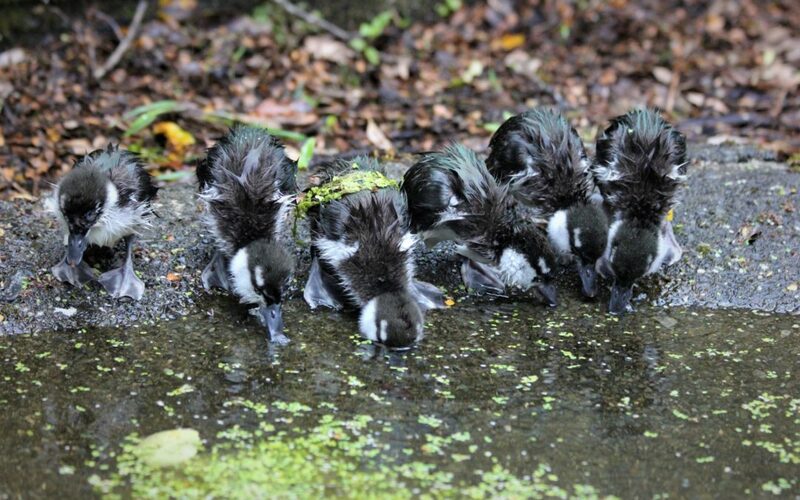 A star breeding pair at Pukaha National Wildlife Centre has lived up to expectations after another group of endangered whio [blue duck] have successfully moved on to fast-water training in Turangi. It’s the second clutch of the 2019 season for Pukaha’s breeding pair Jimmy and Jazzy. After being reared by Ali Hull and her team, the juveniles were sent to Turangi for some practice in the fast-flowing water before being released into one of the central North Island’s strictly monitored zones. “They are really important for the ecosystem and help to keep the water clean, using special ‘lips’ on their beaks to scrape insects off the rocks. Whio require very clean water so their presence indicates how healthy a river system is”. There are approximately 3000 whio in the wild. They are aptly named ‘torrent ducks’ because of their preference for fast-flowing water. They are considered nationally vulnerable due to loss of habitat and the predation of stoats. “The Whio Recovery programme has been going really well thanks to how well the general public have got behind it,” Hicks said. The wildlife centre is also releasing four juvenile shore plover [tuturuatu] on to Motutapu Island in the Hauraki Gulf, the site of the world’s largest pest eradication programme. “Together with the Isaac Conservation and Wildlife Trust, this would be our most successful year yet,” Hicks said.